It’s week 10 in the college football world and the beginning of the college basketball season. Here’s what’s going on at Army, Navy and Air Force. Football vs. Central Michigan – 3:30 p.m. EST: After absolutely throttling (76 points!) East Carolina on the road last week, the Mids return home to host the Chippewas, who are coming off a 26-22 win over rival Western Michigan. You might think that Navy will run away with this game after last week, but Ricky Dobbs is doubtful for Saturday. Without Dobbs at the helm, this one may be much more interesting. Basketball at Buffalo – 12 p.m. EST: Things didn’t so well for Navy on the road against Texas, as they lost 83-52 in their season opening game, which was part of the 2KSports Classic Benefiting Coaches vs. Cancer. However, not many people were expecting them to pull off the upset against a perennial national power. With that game behind them, the Mids look to get their first road win at Buffalo, who will be opening their season this weekend. Football at Kent State – 2 p.m. EST: Army is coming off a 42-22 loss to Air Force, which gave the Falcons the Commander-in-Chief’s trophy for the first time since 2002. The Black Knights are 5-4 overall and one win away from becoming bowl eligible. Last week, Temple took down Kent State 28-10 at home, so the Golden Flashes will be hungry for a win, as they’re just two away from going bowling at 4-5. Basketball vs. Vassar – Nov. 11 (Tonight) – 7 p.m. EST: It’s the start of a new season for the Black Knights tonight against Vassar. They’ll be looking to improve on their 14-15 record from last year, which was the most wins in a season for Army since Bob Knight (Yes, that Bob Knight) won 18 during the 1965-66 campaign. That was one season before this guy came to West Point. This is the opening game for Vassar as well, who went 2-23 in 2009-2010. 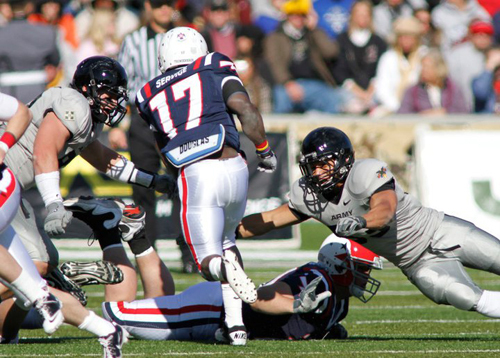 Football vs. New Mexico – 4 p.m. MT (6 p.m. EST): As stated above, the Falcons took down Army last weekend by 20 to land the CIC trophy. New Mexico knocked off Wyoming at home 34-31 last week to earn their first win of the season and improve to 1-8 overall. Here’s a preview of the game from the Lobos. Basketball vs. University of Colorado at Colorado Springs – Nov. 14 – 2 p.m. MT (4 p.m. EST): The Mountain Lions and the Falcons square off in an exhibition game this Sunday at the Air Force Academy. UCCS won an earlier exhibition this season against Johnson & Wales, but will face a much tougher time against Air Force.